More than 200 detained in France as hundreds of thousands rally for climate worldwide. 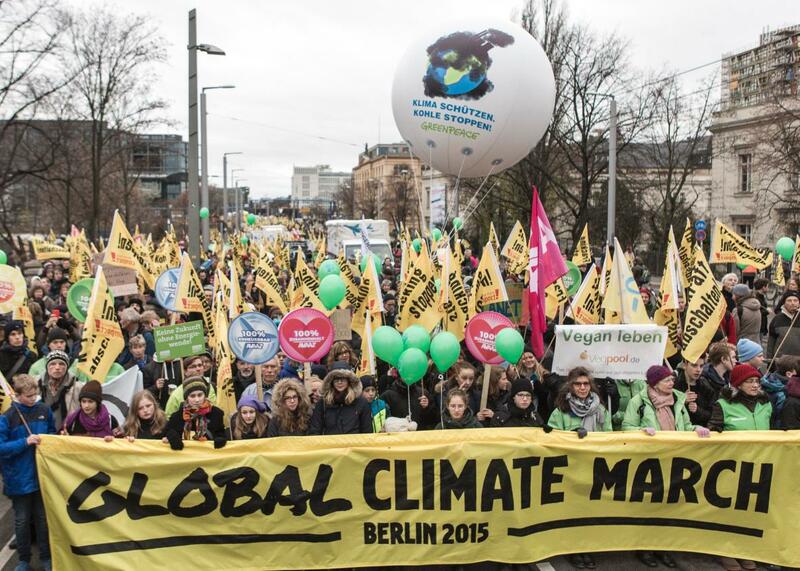 Activists participate in the Global Climate March on November 29, 2015 in Berlin, Germany. Hundreds of thousands of people around the world got together for rallies and demonstrations on Sunday to demand action on climate change from global leaders who are gathering in Paris for a major summit on the issue. In Paris itself, things got off to a violent start as police fired tear gas at protesters and 208 people were detained after clashing with riot police, 174 of whom were being held for possible charges. French President Francois Hollande called the violence “scandalous,” noting that it took place at Place de la Republique, which has been used as a memorial square for the 130 people killed in the Nov. 13 terrorist attacks. 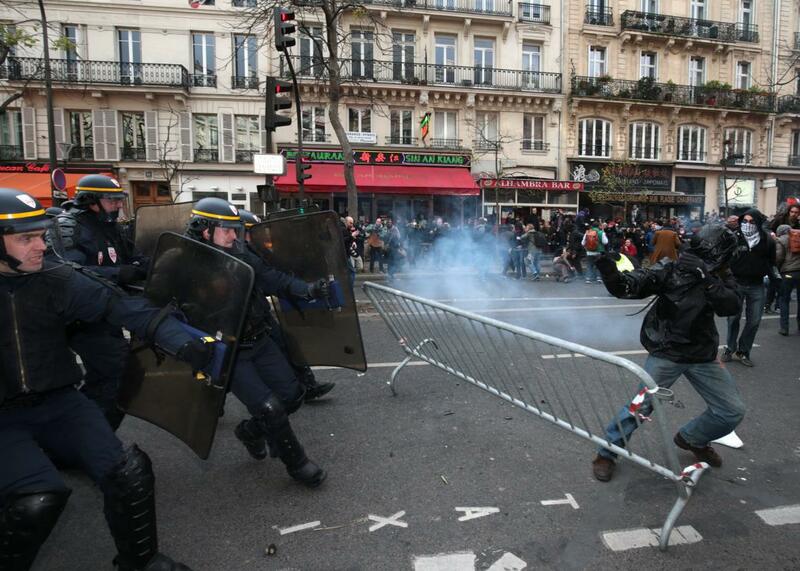 Protestors clash with riot police during a rally against global warming on November 29, 2015 in Paris, a day ahead of the start of UN conference on climate change COP21. Demonstrations are essentially banned in Paris as part of the state of emergency imposed after the attacks. Instead, activists laid out more than 20,000 shoes in the Place de la Republique to symbolize the marchers who would have been there. Pope Francis even sent a pair of plain black shoes to be included in the protest. 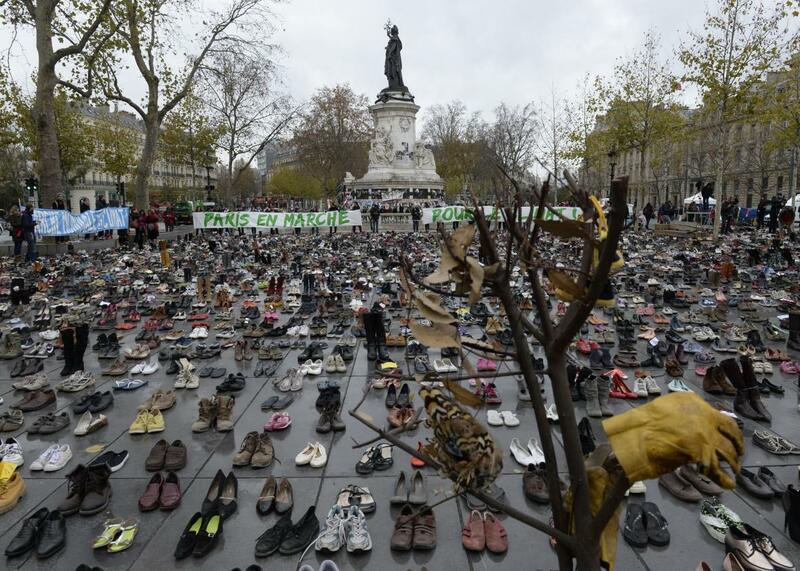 The Place de la Republique is covered in hundreds of pairs of shoes on November 29, 2015 in downtown Paris, as part of a symbolic and peaceful rally. Around the world, there were more than 2,000 events ahead of the summit that officially begins on Monday. Initial estimates put the number of people who took to the streets at 570,000, although activists say the number will easily surpass 600,000 once events scheduled for later in the day take pace. 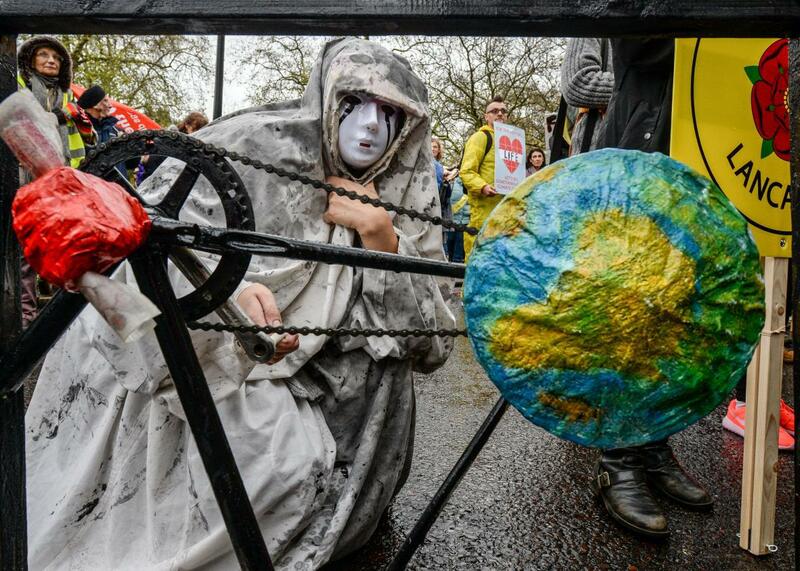 A protester with their creation representing money makes the world go round during the London Climate March as part of march events around the globe on the same day on November 29, 2015 in London, England. “These are the biggest set of global marches in history,” said Sam Barratt from Avaaz, one of the organizers of the rallies. 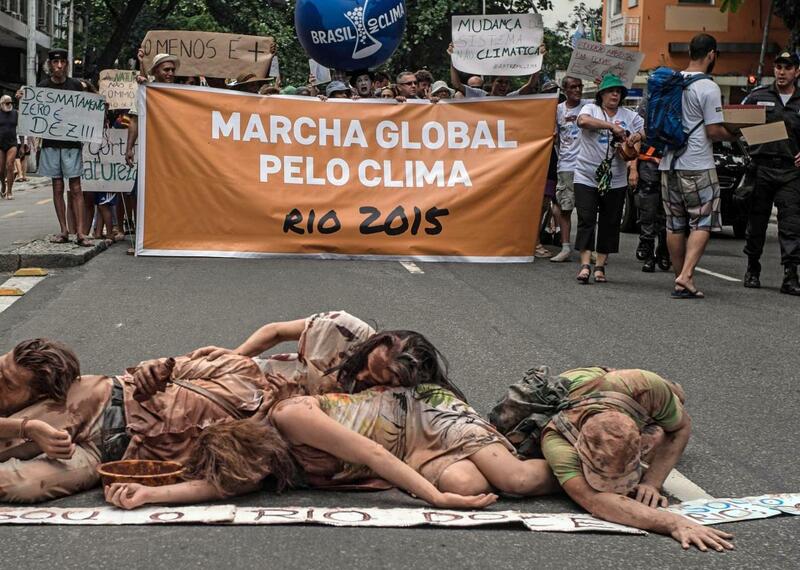 People perform during the Global Climate March at Ipanema beach in Rio de Janeiro, Brazil on November 29, 2015, on the eve of the UN conference on climate change COP 21, to take place in Paris. A person dressed up as a panda bear takes part in the Global Climate March on November 29, 2015 in Madrid. 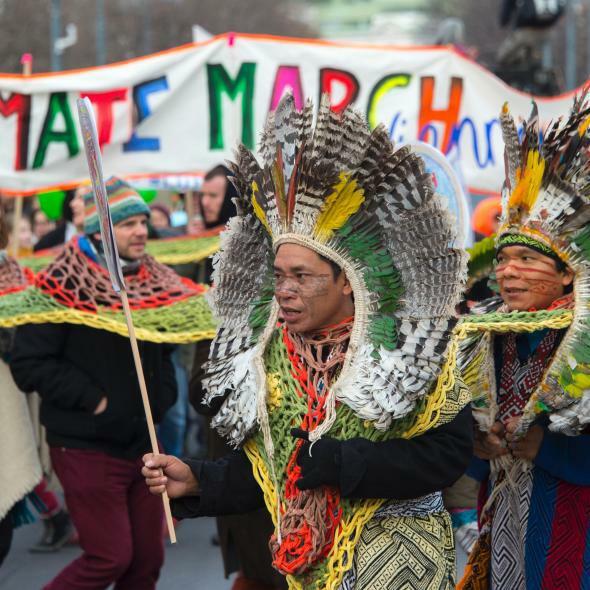 Protestors perform during a Climate March on the eve of the official opening of a 195-nation UN climate summit in Paris, in Vienna, Austria on November 29, 2015. 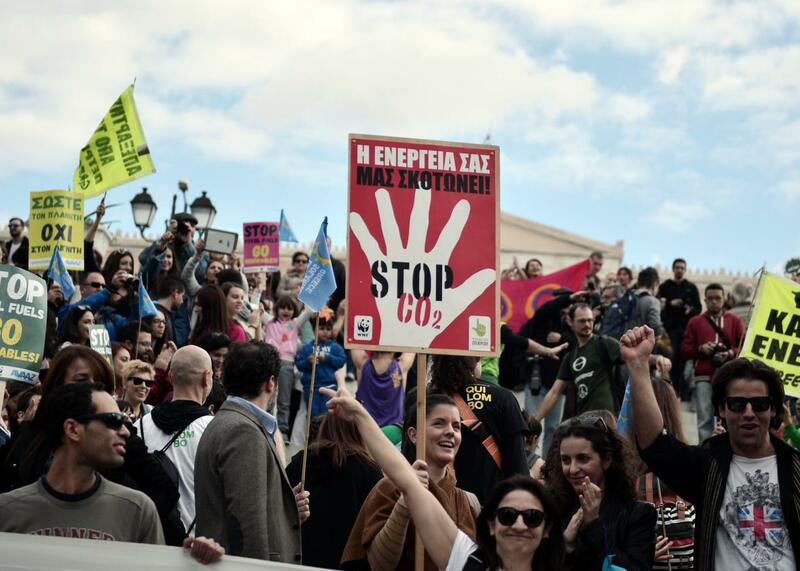 People participate in a march in central Athens on November 29, 2015. 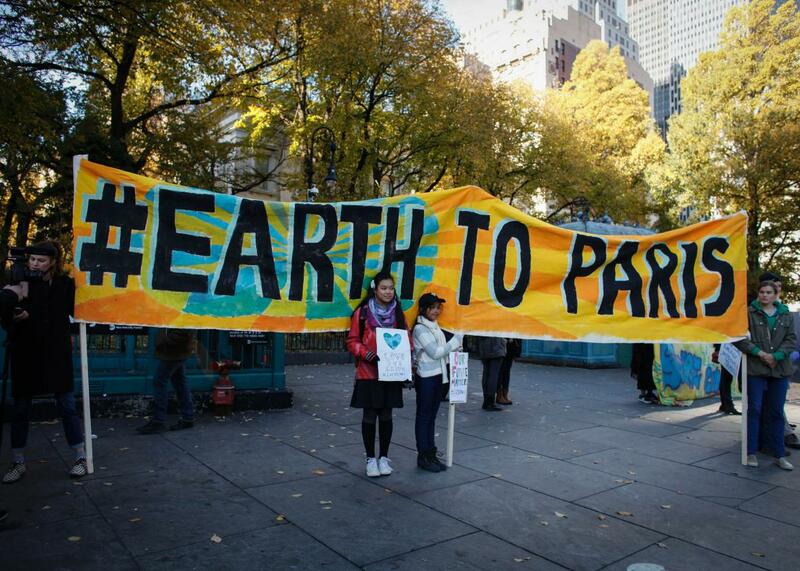 People hold a banner as they take part in a global climate march near City Hall on November 29, 2015 in New York City.